Global Mobility Solutions does not just facilitate corporate relocations around the globe, it tries to make the world a better place, as well. The company routinely gives back to its community through organizations like Move for Hunger and St. Mary’s Food Bank. Through its cooperation with the Move for Hunger program, Global Mobility Solutions and its provider network partners donated 50,000 meals to St. Mary’s Food Bank. Lisa Notaro of St. Mary’s Food Bank presents the Hunger Hero award to Steven Wester, President of Global Mobility Solutions. 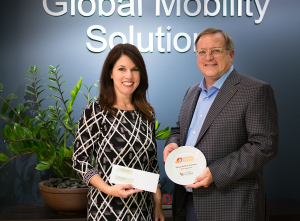 Lisa Notaro, Chief Development and Communications Officer for St. Mary’s Food Bank Alliance, recently visited the world headquarters of Global Mobility Solutions to deliver the news that, because of its contributions, Global Mobility Solutions was named a 2016 Hunger Hero of St. Mary’s Food Bank, a great community service honor. More recently, at its 2017 relocation forum, Global Mobility Solutions and its partners raised funds to donate 53,000 meals to those in need. St. Mary’s Food Bank Alliance, the world’s first food bank, is a non-sectarian, nonprofit organization that alleviates hunger by efficiently gathering and distributing food to the hungry. Serving two-thirds of Arizona’s 15 counties, the organization is committed to volunteerism, building community relationships, and improving the quality of life for Arizonans in need. Founded in 1987, Global Mobility Solutions is a global corporate relocation services company that specializes in workforce mobility. 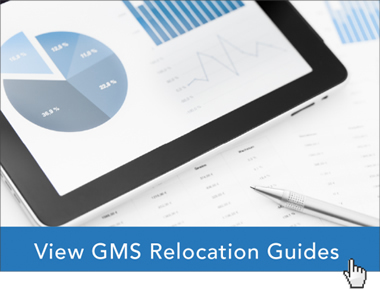 The company’s corporate relocation services include global assignment management, domestic relocation management, and a range of pre-decision solutions. Global Mobility Solutions is a perennial winner of the HRO Today “Baker’s Dozen” customer satisfaction survey, being recognized as a top relocation company for the last four consecutive years.